it started off as a blogshop by selling online through facebook and then she slowly ventured into taking a spot at the curve on weekends flee market. 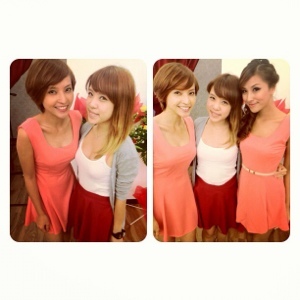 then she tried out at klang, cubie house and finally her official boutique was launched yesterday at Sunway Giza Mall. most of our friends went by at about 12pm during the official opening and those who were working dropped by after work. i arrived at about 8plus with my other half and seeing Sonia babe and Sean there already. the interior is simple and still being worked on. 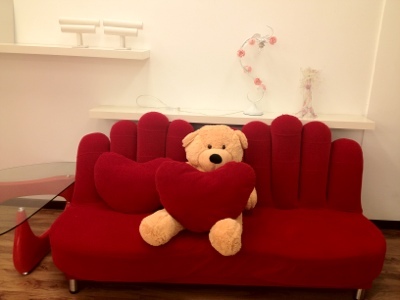 there's this really cute sofa with a nice big bear to hug. the down light makes it feel cozy and comfortable to spend hours to shop and hang around there. most of the clothes are taken from out of Malaysia when agnes travels around. they are all in limited numbers and u don't find them in other blog shops or boutiques. so there is no need to be worried about clashing of dresses at parties. i've gotten a couple of tops from her previously before she finally opened her boutique. good quality and very different. there's an opening promotion going on now. click here ♥ so don't miss out! coz even i got myself a piece. Lavendress (formerly known as Asia Diva) is located inside Sunway Giza Mall, Above Nandos. Take the Nando's stairs up. :) and it's opened from 12pm - 9pm.